20-sim can be downloaded from the website www.20sim.com. This is an installation file that will install 20-sim on your computer. The first 4 steps are equal for all users. Depending on the type of license (single, floating) you have to follow different steps to activate 20-sim. 1. 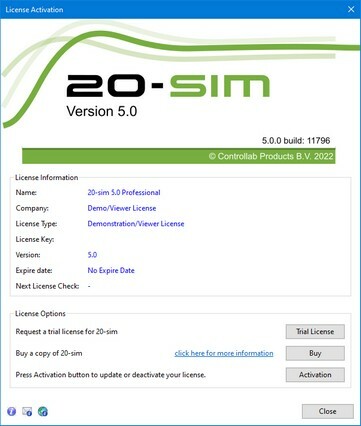 Download and Install 20-sim on your computer. 2. During Installation you will be asked to install the (optional) Python 3.4 package. We advise to keep the default setting: Yes. 3. Start 20-sim (from the Windows Start Menu choose 20-sim 4.7). 4. If you have a valid license key or license file, press the Activation button to enter your license key or browse for the license file. If you do not yet have a valid license, press the Trial License button request an trial license or press the Buy button to purchase a license. If you want to continue in Viewer mode (no save functionality), just close the dialog without activating 20-sim. 5. Select which kind of license you have and who should use the license. If you are using a single license, you have to enter a license key or license file. 6. 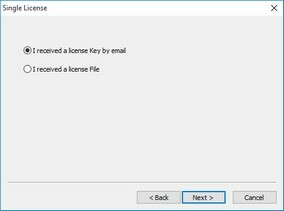 On the next dialog, select I received a license key by e-mail and enter the key in the next dialog. When you received a license file, you have to enter the location of the license file. You will be asked for confirmation (click Activate Now) and activation will be carried out. 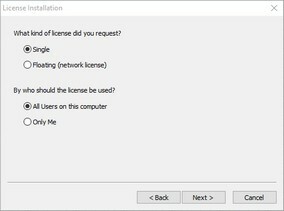 After a successful activation process the License Information dialog will show the new license. If you are using a license that is shared by more users (floating license, also known as concurrent license or server license), you have enter the received license key and a location on the server (a normal Windows shared folder) first. This location on the server should be accessible to all users and have read/write permission. The floating license will be stored at the selected location. 6. On the next dialog, select First Installation and then enter the license key and the location on the server (Windows share). On the location that you have given, a license file 20sim.lic will be installed. Remember the location of this file because every new user of 20-sim will need to enter it. You will be asked for confirmation (click Activate Now) and activation will be carried out. After a successful activation process the License Information dialog will show the new license. If you are using a floating license that was already installed you have to enter the location of the license file. 7. On the next dialog, select Administrator already installed server license and then enter the license location (the location of the file 20sim.lic). After a successful entry of the location of the license location, the License Information dialog will show the new license.